Was gonna include a doodle of Tommy the Truck hugging his mother in the bottom panel but (1) SO MUCH BUBBLEZ and (2) this monologue is really the Professor's moment. Todd, you are a terrible liar. Once is a point, twice is a line, three times is a trend. …damnit, I’m thinking of z-scores again, aren’t I? Actually, given that he sued people into unemployment at the last school, it looks like he jumped straight to “enemy action”. He shook her and put her in the hospital. That’s one. That’s what the “jumped straight to” means – Trunchy is ignoring #2 and treating it as enemy action straightaway. Todd only knows of (and only mentions) two, but Tom Sr. knows of at least three, counting the incident at the last school that led to the lawsuit. He’s just standing by his child. If this were the reverse and it was a child telling the truth and the parents automatically standing by what others say and ignoring and punishing his child. He wants to trust his son, believe in his words. Tommy has learned some bad habits from his father, but these people aren’t evil. Tommy wants his dad’s approval and just copies things he sees. While they are by no means innocent, they surely are not evil. This is just a very sad situation. And yet, what is evil if not the sum of all of humanity’s pettiness and hubris? It is when we blind ourselves to the possibility of our own error that we allow evil to take root. This may not yet be a great evil, and it may yet be cured, but thus far they have allowed the seeds of tyranny to fester within their son as it has in themselves. It is not a great evil. It is not an irredeemable evil. It isn’t even an evil worthy of the reflexive reprisal we have offered it in the past, but it /is/ an evil. A petty, self righteous evil, which (like every evil I have ever encountered) thinks itself good because it will not consider itself too closely, lest it perceive itself as less than perfect and justified in it’s methods and motives. Don’t let his admirable affection for his son make us forget his own petty hubris. This is a man who cleaves with quiet desperation to the image of respect and respectability. He insists upon his titles, because he fears he is nothing without them. He demands the semblance of respect to elevate himself above the other primates, because he fears what it means not to be respectable and has no faith in the respect he has actually earned. He projects that respectability upon his son, allowing Truck to feel high and mighty without having earned it. What do they deserve for that? It is often tempting to heap scorn upon them, from our lofty vantage in the audience. Seeing what we see, it becomes all too easy to lever our own petty, prideful judgements, and they don’t deserve that. You aren’t wrong…this is a sad situation, and heaping evil upon evil will not salvage it. They deserve the whole truth of things. One can only hope it humbles them enough to stop using their pride as blinders. That it strains the trust between father to son, but not to breaking. It is unlikely that this will be a swift or easy process for anyone involved, but as tumultuous as it is likely to be it is what they deserve as well as what they need to have a chance at shedding evil. Daaaaaaaaaaang VaporWare! I was going to make a comment on how I was starting to feel sorry for err… whosisname but you blew it out of the water! I applaud your eloquent words and humbly exit stage left, well and truly impressed. Yeah, however even though Truck is an angel at home, he obviously isn’t at school. I can understand his father standing up for him, just as Todd is for Selkie. Btw, the recycling and Google Play adds are doing rogue random sound without clicking play. IIRC you wanted us to help you filter ads that do that. I wasn’t browsing ads at work or anything, but it’s still very annoying, especially if it is loud. Truck is an angel at home because he’s not stupid. He knows how to manipulate his parents. And when Trunchypoo finds out the truth, Truck is in ridiculous amounts of trouble. I’m positive he’s a filthy king and ace who would throw his own kid under a bus to protect his public image. “filthy king and ace” … it’s an old timey expression. because I try to keep myself G-rated here. Squint your thinking and you can probably figure it out. I’d rather think he respects his parents way too much to not throw tantrums like he did at the library. May Trunchbull run into some less-civilized parent someday. Actually, Trunchbull is not being a good dad. And I’ll tell you why. I just recently had experience of seeing good parenting done with a kid that had been accused of bullying. Instead of denying that it happened, instead of getting defensive or accusative, the mother sat down with the parents of the victim and worked out between them what they could do to remedy the fact. My friend’s son has never been a bully at home, has never been violent or aggressive. She could have assumed that they were making it up. What she did was ask what happened with the son – and ignored everything but the bare facts of what happened. Her son had said some cruel things, but he didn’t understand that they were cruel. He was given gentle direction, and then with supervision from both sets of parents, the victim and bully spent time together in positive activities during the holiday. By the next term, they were friends, my friend’s son learnt not to say things that hurt people and learnt how to make a positive difference in people’s lives. I’m not saying Truck is like my friend’s son – for one case my friend’s son was being egged on and told what to do by someone else who was the actual bully. However, a change of teachers, and some positive guidance has ended that bullying situation – and everyone including and especially the victim are happy. But my friend who is the parent, had a more constructive and postive way of dealing with bullying that Trunchbull who sticks his head in the sand and refuses to believe anything bad of his son. So no. Trunchbull is not being a good parent – he’s not looking out for the best for his son by finding out what actually happened. He’s reacting emotionally and defensively to what he sees as an attack on his son rather than as a situation to be resolved. I like your friend a lot. Worse than that, he’s presuming that his son isn’t even capable of the behavior he is accused of unless proven beyond a shadow of a doubt. It’s possible that Mr. Trunchbull is overcompensating for an incident or two in his own past in which he was falsely accused and persecuted, especially given that he keeps saying words like “evidence” and “court” and “defendant” when he’s not even a lawyer. But that doesn’t excuse him refusing to acknowledge that his son is no different to other children and all children will default to “bad” behavior if not guided properly. Everyone is simply born naturally selfish and wanting to dominate others. Call it survival instinct, sin nature, or whatever science/religious/psychological/philosophical spin you want to put on it, the fact of the matter is that no one is born civilized and mature and empathetic. They are born uncivilized and immature and un-empathetic and will learn to be deceitful, thieving, and probably violent if not corrected. Because they are children. Yes, some learn at a younger age than others to try to treat others with actual respect and not just “play” respectful. It helps if there are siblings and cousins or at least close friends. But what helps the most is parents who understand that their children are naturally little savages and they need to guide them away from savagery and that’s what the parent-child relationship is all about. Refusing to see the potential for savagery just leads to the savagery festering, and we end up with kids like Tommy Trunchbull. And worse: adults like Tommy Trunchbull. This is Mr. Trunchbull’s essential problem: refusal to treat his son like the child he is. Tommy is not a naturally good kid because there are no naturally good kids. “Goodness” needs to be learned, and nobody is perfect. Short addendum: It is not too late for Tommy. If he still had this attitude as an adult, it would probably be too late. But what is likely to happen next will probably be good for him in the long run. And his father too. And at the very least it will be good for everyone else. Actually, he KNOWS his son is capable of this kind of behavior. Remember the first time we see Trunchbulls at the school? The mother is in denial but the Prof. said “He had BETTER not have hit a girl.” The way he said it and the look on his face tell me he knows. It’s not until the next page when Todd puts the pieces together that Tom gets defensive and starts to push Selkie’s buttons so he can use ‘her attack on him’ to manoeuver his son out of trouble. He knows, he HAS to know: What we are seeing here is more manoeuvering. Exactly. If microchips “worked that way”, the Trunchbulls can prove where the kids are at all times so that they can say that the little liars were no where near their poor Tommy. I’m guessing that’s the reasoning behind it. Empathy is an ability which has to be present, before it can be nurtured by education/parenting. Some kids are highly empathetic without any guidance, whatsoever, and some kids are more selfish than Scrooge McDuck, even though their parents correct it all day long. People with autism usually have a very low empathetic ability, which they were born with. While not all autism is the same, as someone who did have a mild version at a young age (noise sensitivity, inability to focus, difficulty with most non-“creative” subjects, extreme difficulty with memorization, etc. ), empathy is not necessarily a problem at all. Going with Wiktionary’s definition, I had no problem at all with the second “capacity to understand another person’s point of view or the result of such understanding”. When peoples’ feelings about things were explained, I had no problem understanding that. I did indeed have a problem with the first definition “the intellectual identification of the thoughts, feelings, or state of another person”, not because I didn’t care but because I had difficulty paying attention to that kind of thing. But even in my case, I would have acted much worse if not corrected even if I “knew better”. Children constantly push the limits and the “golden rule” is always something that needs to be taught. I am someone who actually remembers that he was definitely not a “perfect child”. I rarely got into actual punish-able trouble over conflicts with other children, but I was often arrogant and meaner than I should have been (in hindsight) until I was corrected. I’m talking about things where issues with the first definition (gauging what people are thinking at the time) were no excuse, I genuinely “knew better” and should have been nicer on principle. Bear in mind this is coming from someone who was genuinely mostly well-behaved to the point of totally getting away with getting drunk on wine in the middle of a school day on the day I became legally old enough to drink (the drinking age being 16 at the time and place in question) because there was literally zero detention-able shenanigans from me (other than homework issues) the rest of the year. Even I needed correction at times, and if I needed correction on the principles of treating others right, then no one doesn’t need correction on how to treat others right. True, and even though I’m not saying nobody needs corrections, I’m merely saying that nobody is born without the ability, and that everyone must be taught to be empathetic. But for some kids that one time is enough, while others can’t be taught at all because they simply can’t understand. I’m screwing up my sentences. EDIT: that NOT everyone must be taught to be empathetic. I quite agree with MuchachoNL here. I’d just say it this way: Some people are just born without a soul. Sometimes people are born without arms, or legs, or a working nervous system. People love to point to this, that, or the other thing as reasons for this to happen. But it doesn’t change the fact that they were made incomplete. Some people are just born without souls, incomplete. They lack anything inside of them that can judge a right or wrong action. Of course, science won’t even talk about souls, let alone look for a reason why someone may be born without one, so few bother to even think about it. I’ve seen estimates of psychopaty and sociopathy being in anywhere from 1% to 9% of the population. The vast majority of them don’t murder people, however, simply because of extensive negative reinforcement (don’t break the law or people with badges and guns will hurt you), unnecessary for the vast majority. A little guidance is all that’s needed to get most kids going the right way. A lucky few don’t even need that. But those without souls still make lives miserable around them, and odds are you know or have met several in your life. Just nothing inside them. Is Truck one of these? Was he born without a soul? I dunno yet. As far as I can see, his parents haven’t done much to try to guide him to a proper path. We’ll have to see. I think it’s a mistake to use the label ‘soul’ to mean the ability to tell right from wrong. The latter is a genuine measurable fact. Some people are indeed born that way. It can also become true of other people later in life if they receive a certain kind of brain damage. In the last ten years, scientists have in fact begun to get a reasonably good idea of exactly which parts of the brain and/or brain chemistry are awry in such a case. However, saying that such people have no soul is equivalent to saying they are nothing more than meat machines. It’s saying that they have no value as human beings — that God, if you believe in God, does not care about them any more than he cares about a toaster. And that, I think, is a very dangerous thing to say about anyone. Don’t confuse symptom with cause. That’s primarily why science doesn’t want to talk about souls, all it can measure is symptoms. As for ‘meat machines’, yeah, they are. Basic physical needs, nothing more. But your comparison to toasters comes with inherent implications that toasters don’t matter at all. Look again at that last sentence I wrote. ‘At all’ is an absolute. Most humans use and hear absolutes and never think about what they actually mean. Right now, I’m asking you to think about it as an absolute, in it’s full meaning. If you want to stuff words in God’s mouth, you have to think about things in absolute terms. And once you’ve done so, do the only sensible thing: Don’t. Not tangling with that mountain of assumptions. Nope. Neither the time nor the place. There are some children who actually can have a hard time being deceitful, or hurtful (save by obliviousness) — both difficulty with fiction-lies and a hypersensitivity to other people’s needs can be aspects of being on the autism spectrum. In those cases, the learned behaviors are deceit and deliberate hurtfulness! The fact that he’s actually talking to Todd, and not just talking at him really changes my thoughts on him. He’s still blind to what his son is capable of, but is currently trying to find/use common ground with Todd to actually communicate. Now I’m really eager to see how the rest of this unfolds. Ken Ham was asked a very similar question about if evidence existed that refuted his. He said pretty much the same thing. That is an awesome line. I’m stealing it. Your skillful use of the ellipsis manages to omit that, in my opinion at least, the only thing Professor Trunchbull was saying that could not be changed or superseded was that Tommy is his boy. I was aware of that line, and how being his boy is something that would make him try to protect Tommy foremost. However, one of the worst things you can do, as a parent, is allow bad behavior to go unchecked. I suspect that while the Professor wants to protect Truck, he also still has a blind side concerning believing his son and is willing to TRUST Truck when he lies about who was doing what (as we saw when he lied to the girl with braids, Giselle or something). I for one am hoping that Prof. Trunchbull continues to be a good dad, continues his friendship with his son, even when he learns the truth and, like a truly good dad, takes action. I have done some pretty stupid, downright unacceptable things in my time, and my dad, even when he punished me, has explained that he has my best interests at heart, and we are still friends. In sum, nobody is perfect, Professor Trunchbull is blinded by love, and manure is about to hit the windmill. But in the light of those streaming trails of nutrient-rich horse excrement, idiots have the capacity to become, if not smart, then at least not idiots either. And hoy! Professor Trunchbull shows the capacity for change! 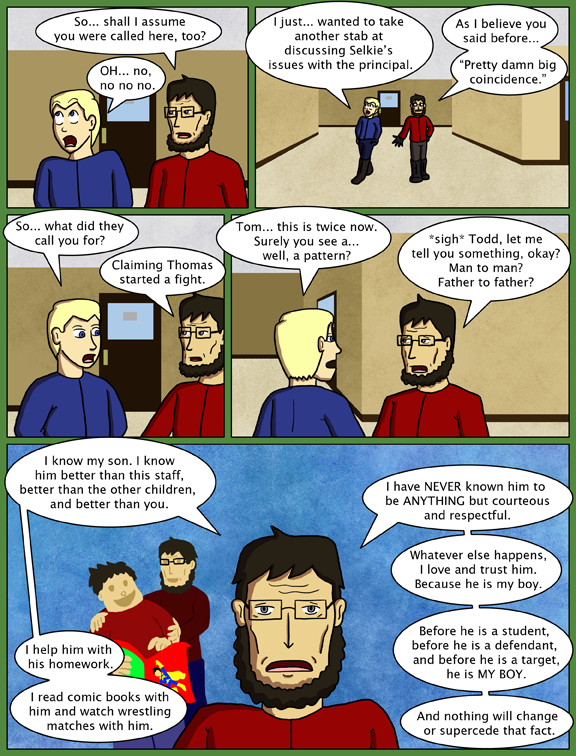 Look at panel 4: Todd calls him “Tom” and he doesn’t object! Perhaps you should hope that he becomes a good dad. The proof is in the pudding, and what Tommy has become proves that he has not been a good dad so far. With any luck, hearing the recording of his son essentially saying “I am a bully because my father has taught me to be” will teach him a much-needed sense of shame. …and then you remember that he destroyed people’s careers because he preferred to believe that adults had formed some sort of conspiracy against his perfect son rather than admit that said perfect son could be getting into fights. Sorry, Trunchy, it is way too late to start acting like a human being. Incidentally, Dave? I appreciate what you’re doing, trying to show the human side of each of your “villains” in turn, but I don’t quite buy it this time. Trunchy was in a rage at the treatment of his son, and suddenly he’s confronted with the man who was at the center of the last “false accusation”. The best I can see him giving Todd is “I don’t have time for this”, and more likely an accusation that he’s part of all this. When they get to the office and the full truth of Todd’s technically-true statement about “Selkie’s issues” becomes apparent, I expect accusations of conspiracy to start flying. Well, he’s suspicious of the ‘coincidence’, his sudden turnaround could is further manipulations on his part, trying to make himself sympathetic before they find out what’s going on. No, I think it’s more likely that Mr. Trunchbull isn’t being manipulative at all. He’s sincerely bought into his own line of thinking because he thinks he is always the smartest person in the room. Oh, I entirely agree with you there. He’s very sincere in his beliefs. We were discussing his swift change from raging to calm discussion, which seems to be a bit out of character (at least to me it does). Aw, heck, it just occurred to me: that’s another reason to continue his denial that anything is wrong. If it comes out now that Truck really is starting fights, then the people whose lives he ruined can countersue him into the poorhouse, and they’d be fools not to. The thing I think I admire most about your story telling is your ability to flip a character to make them not as… Hard to read as they were I suppose. Well played. This guy’s an odd duck. Oh well it’ll be nice seeing him get his comeuppance. Nah– there are two ways to become that confident: be right a lot, and refuse to hear anyone say you’re wrong. Trunchbull has both going for him. He’s a highly respected academic, so he’s right a lot in his field of expertise. And then for anything else, he ignores any evidence of wrongness. I suppose it can and does happen, but you have to admit MOST people like that are really HARD on their kids, not blindly defending them. This is true, that is the norm. Makes me wonder about Mr. Trunchbull’s childhood. In my experience, a childhood of never being good enough and always being told you’re wrong, no matter what, can lead to just such a refusal to admit wrongness in adulthood. Perhaps it also informed his child rearing attitudes, in going the exact opposite way with his son? It’s quite good! 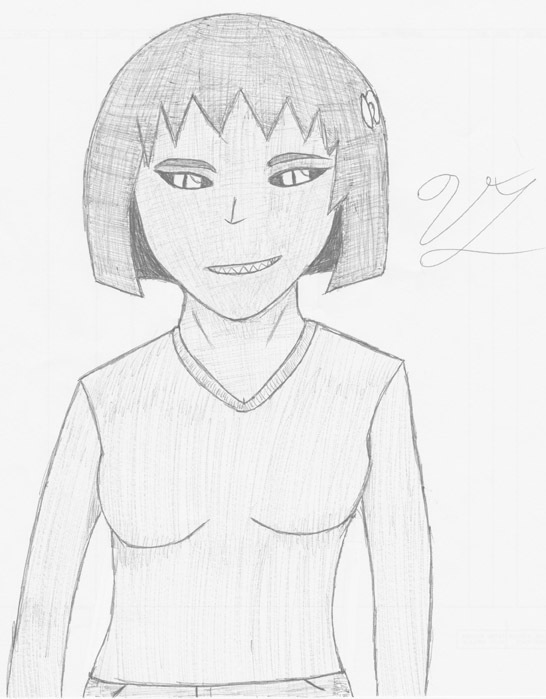 I am, alas, entirely inept at the visual arts, so I can only appreciate others’ talents. I don’t see this as humanizing the old codfish, but showing how delusional he is. Trunchy, you might want to hurry up and take the blinders off. At this rate, you won’t be standing in a courthouse watching your son get indicted, but in front of a grave watching him get buried. There’s only so much a victim can take before they snap and that often means pain or death for the bully. Good point. He’s currently chosen a creature with claws, fangs, and poisonous body fluids as his preferred victim. This does not speak well of his ability to pick his battles. Someone who feels that completely invulnerable usually doesn’t realize that they’re not until after the first bullet hits them. Also, you mention delusional. And you are correct. When you start using words like “defendant” and “target” when people are telling you that your kid is starting fights, your paranoid conspiracy theorist is showing. I hate Trunchbull even more now. Before he is your son, he is Truck. He is himself. How you see him is completely irrelevant to the nature of reality. Trunchbull has decided that his perception of the world is what matters, not how the world might actually be. We’ve all had to put up with this from someone at some point in our lives unless we were in Truck’s position. Typo alert: “supercede” should be “supersede”. Curse you and your magical ability to humanize even your most dickish charachters! No wait that’s amazing, WRITE ON SIR. RIGHT ON.